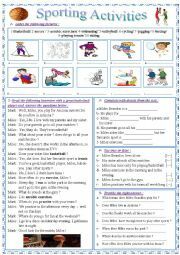 It´s a reading comprehension worksheet dealing with sporting activities,based on an interview with a great basketball player. I hope it will be useful.Thanks for your attention. Have a wonderful night . 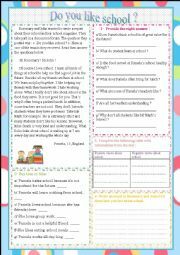 it´s a reading activity followed by gap ffilling activity and comprehension questions. Then a writing activity. I hope it will be useful.thanks for your attention . 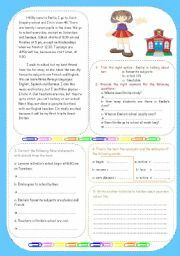 it´s a reading comprehension activity leading to a writing one . Thanks for paying attention . 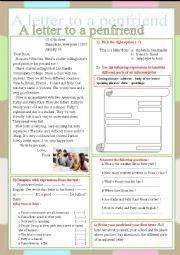 It´s a reading comprehension worksheet dealing with friendship.Students have to answer multiple choice questions, correct false statements and to find synonyms and antonyms of given vocabulary.Finally they have to express their opinions about the importance of friendship .I hope you will enjoy dealing with this topic. 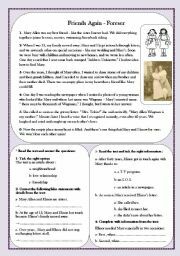 It´s a reading comprehension activity leading to a writing one .It deals with the impact that a good teacher may have on his or her students.As a teacher,the story in this text really impressed me.I want to share it with you,colleagues and friends.I hope it may be useful for your students.Have a wonderful night. 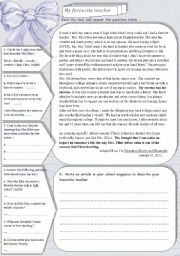 A reading comprehension worksheet, based on a text and different types of comprehension questions. I hope it would be helpful. have a wonderful night. 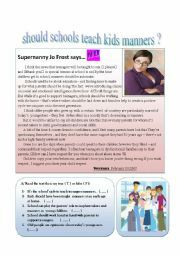 Should schools teach kids manners? 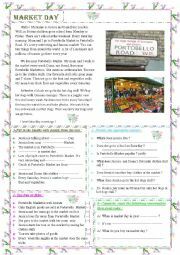 It´s a reading comprehension worksheet based on an article from Woman magazine,personnally I found it interesting .It involves comprehension questions, true or false statements ,voccabulary and pronunciation parts.I hope you ,too, find it interesting.Thanks for paying attention.Have a nice evening. it´s a reading comprehension worksheet dealing with the impact of Internet on the learning process.students will answer wh and yes/No questions,complete and correct statements with details from the text,then find synonyms for given vocabulary.thanks for your attention.